Do you have three phases provided to the central electrical switchboard of your house ? Did it ever occur to you that by pulling such a 3-phase, 5 wire installation straight to your living room, to the place from which you power your Hiend Audio System, you could gain some additional “listening experience” benefits arising therefrom ? Most probably it did not. Obviously, it is not an easy feat if your house has all the finishing touches already in place, with the nice tapestries, paint, walls, etc. But on the other hand, if it just so happens that you are only but starting off to “finish” a house that you have just freshly built, in a case where it is still reasonably easy to “accommodate” an extra 3-phase, 5 wire installation cable up to your very target Hiend Audio System location in your living room – you might just want to consider that. 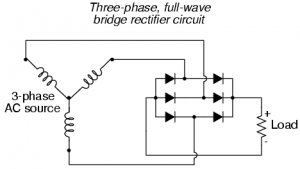 Imagine: Any and all secondary winding of the transformer within your audio device (whatever it may be) is most probably connected to a bridge rectifier. Specifically: to a single phase bridge rectifier, one that has the following pins: “~”, ”~”, “+”, “-”. Obviously, the single phase rectifier produces a very bumpy and uneven pulse train, which needs to be heavily filtered within your C, CLC, or CRC bank. 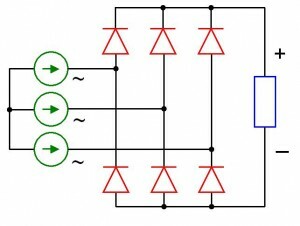 See the green pattern above (source: http://en.wikipedia.org/wiki/Rectifier). b). one that will mount three transformers within his amplifier, and not just one. What possible benefit can be achieved from that, apart from the potentially higher total wattage that can be comfortably pulled of such a 3-phase installation ? The most important aspect is the …. phase SHIFT. Specifically speaking, the 120 degree shift between each of the individual phases of the 3-phase supply line. As can be seen, the resultant DC waveform, a result of the 3-phase rectification process (the green line) is very much even in itself already, without any filtering applied to it. 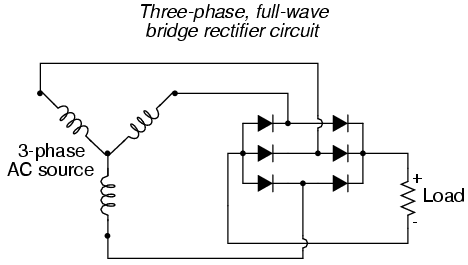 As for the three-phase rectifier bridge, it has 5 pins, instead of four: “F1″, “F2″, “F3″, ”+”, and “-”. 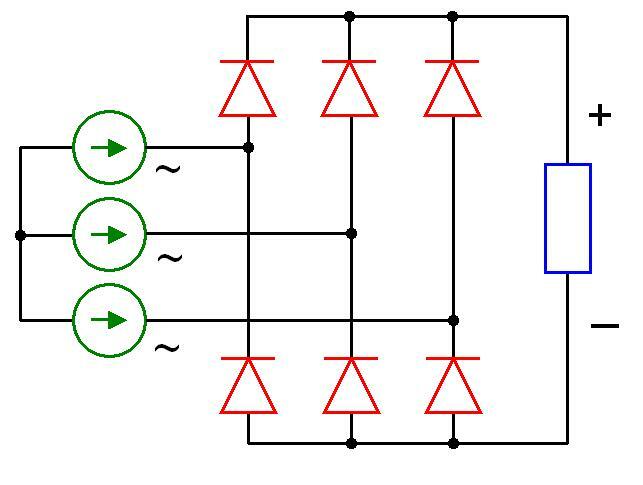 Such an unfiltered DC voltage, as obtained from such a 3-phase rectifier bridge, is of a much higher quality, than the one that you can obtain from a traditional single phase rectification process. The resulting unfiltered DC voltage is much smoother, because it is created as a superposition of the individual “humps” of the half-sine waves, but each one originating from a different PHASE, and each of those shifted with respect to the other ones by 120 degrees. Obviously, such an unfiltered voltage, once routed through your traditional DC filter with your lavish capacitor bank, comes out on the other side much cleaner than it was the case of a single phase rectification process. Some things would need to be considered, if you embark on such a scenario. 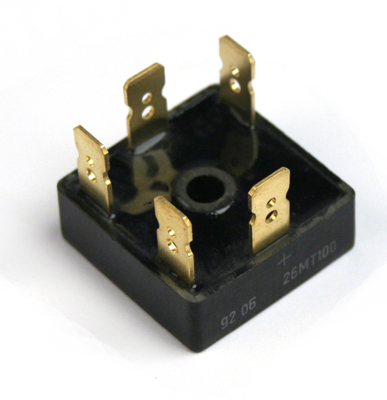 Think about the EMI filters on the primary sides of each of the transformers. Think about how to switch such a device on or off. Think about the fuses on the primary side. But all these can be taken care of, with a bit of healthy DIY, mixed with a “clean and safe work” attitude and some necessary due diligence. What’s more … if you design your setup carefully, you may actually make a dual-mode power supply type of device, capable of being powered from both three-phase, as well as from a single phase, depending on the specific location where you are using it (“equipment on the move”…). Whilst embarking upon such a dual-power-source path, PLEASE do not come up with a straightforward idea of wiring up the single phase IEC with some 3-phase male socket on your chassis. Take great care so as to NOT expose LIVE hot phase wires on the pins of the male IEC connectors, as at any one time, you shall be using only but one power source, whereby the male pins of the other socket are in free air and could constitute a safety hazard, if a live hot mains wire is connected to them through inside wiring. Think about disabling the one power source, when using the other one, and vice versa. A toggle, a selector switch, or something. P.S. Did I implement such a solution in my rig yet ? Frankly speaking, … no, but only because I did not think about that darned 3-phase cable and socket in my living room beforehand. Would I build a 3-phase capable audio device if I had the cable and wall socket in place ? … most probably yes.